I apologize for not blogging for a few weeks. I am working to get the images from my latest trip up on the site and make some major changes to EduPic at the same time. As I've been stuck at home and not in the field, I've decided to post some recent images that for one reason or another I'm calling "Unusual Shots." Like this image of the Gulf Fritillary (Agraulis vanillae) these are not the usual fare. They may not be the most attractive. They may not show the subject in the greatest detail. What they might do, is demonstrate some aspect of behavior, highlight some unique feature of the subject, show the subject from an unfamiliar angle, or demonstrate some informative interaction between the subject and its environment. In this case, it is the point of view. I have many images of adult butterflies with their wings open from the dorsal view, or of the ventral side with wings folded, but no images of the ventral with wings spread. In fact, I don't recall seeing any images of live specimens in such a "pose." I claim no particular skill in capturing such images, and I don't normally seek out or with forethought compose such a shot. Instead, I attribute my luck to the numerous hours I spend in the field thereby greatly increasing the chances of stumbling upon like displays. Edupic Graphical Resource is a teacher-designed free image resource for educators and their students. New photographs and drawings are constantly being added, now totaling over six thousand, all free for use without permission by educational professionals and the students they serve. Images are organized by content area and keyword searchable. 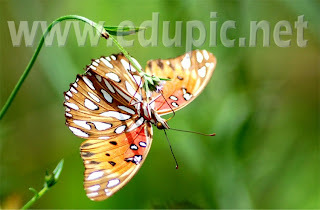 The images on EduPic DO NOT have the watermarks seen here.